07.08.2017 18:00 - A special series of articles on the occasion of Eurolanche’s anniversary. 06.08.2017 23:55 - A special series of articles on the occasion of Eurolanche’s anniversary. 06.08.2017 23:00 - A special series of articles on the occasion of Eurolanche’s anniversary. 06.08.2017 22:00 - A special series of articles on the occasion of Eurolanche’s anniversary. 02.05.2017 19:30 - Eurolanche received exclusive information about Andrei Mironov’s situation. 19.04.2017 08:00 - Eurolanche vyspovedal jedného z najlepších prospektov pre blížiaci sa draft 2017. 18.04.2017 18:00 - Eurolanche interviewed one of the top-ranked prospects of the upcoming 2017 NHL Entry Draft. 14.03.2017 19:00 - Eurolanche interviewed the highest ranked prospect of Colorado Avalanche. 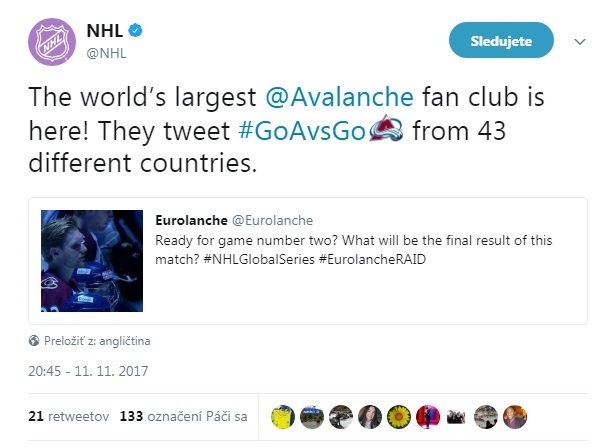 23.02.2017 23:23 - The Eurolanche Fan Club did an e-mail interview with Shjon Podein, who was part of the 2001 Stanley Cup-winning Avalanche team. 02.02.2017 23:00 - The Eurolanche Fan Club met with Andrei Mironov in Slovakia and talked about his possible future with the Colorado Avalanche.